A Weimaraner rescue is the last thing that a new Weimaraner puppy owner wants to face. But sometimes, even the best laid plans don’t work out, and a puppy or dog rescue becomes necessary. Putting your Weim up for adoption is one of the hardest things that you will have to do. Have you thought about what would cause you to give up your dog and how to tell when you should initiate a dog rescue? Whether you are considering a Weimaraner rescue for your dog or you want to adopt a Weimaraner dog , there are some facts about the breed that you need to consider. Weimaraners may end up in shelters when owners can’t take care of them. 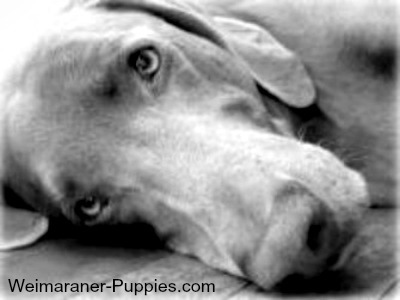 Why Do Dogs End up in a Weimaraner Rescue? • Not Just Beautiful – Weimaraners are a stately and beautiful breed, but that is not a good enough reason to get one. Too many dogs end up in shelters or puppy rescues because an owner thought the breed was beautiful—but did not consider the dog breed characteristics. • Energy Level – Weimaraners are hunting dogs, and, as such, they have been bred to run and hunt all day with their master. They need LOTS of exercise, and their yards must be large and fenced, as a Weinheimer is very likely to hunt birds and small mammals—and take off after them! • Bad Habits – Housebreaking can be a problem, and so can destructive chewing. These habits must be handled immediately, and correction must be done firmly and gently, or you can end up with a Weimaraner with a bad attitude, in addition to bad habits. • Barking – If you spend lots of time away from your Weimaraner, your dog may start to bark incessantly. This can also happen if you try to keep your Weimaraner dog outside. 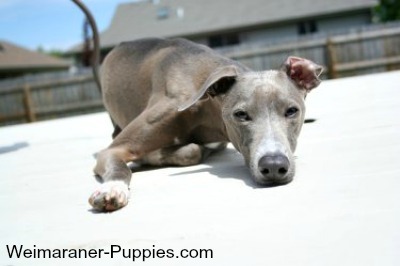 Weimaraners need your attention and they do not thrive in an outdoor dog house and pen. 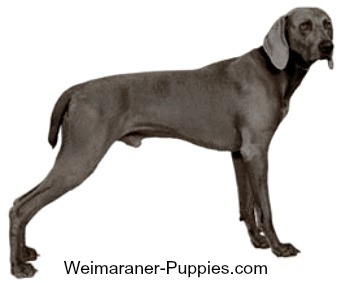 • Obedience Training – Weimaraners are strong willed and will take charge of your family, if given the chance. Your dog must understand that everyone in the family is to be obeyed. 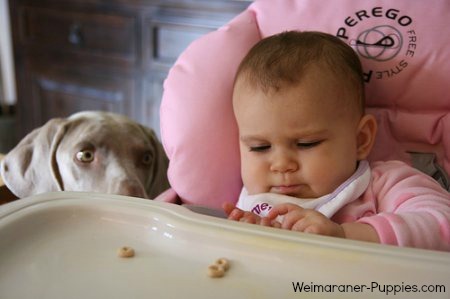 This is a very good reason why families with very young children should think long and hard before getting a Weimaraner. Access over 100 dog training videos for just $1 for 3 full days here. 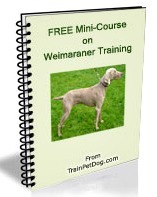 You’ll learn how to train even the most stubborn Weimaraner! A Weimaraner rescue organization works to match responsible owners with Weimaraner puppies or dogs who need good homes. In order for the process to work, you need to be completely honest when filling out an application. Many Weimaraner rescue groups require a home inspection, in addition to an application and interview. Based on your application (and other info you provide), the rescue will match you with a dog that is suitable for your personality and lifestyle. Pet rescues take many precautions before adopting out their animals. The personal questions that they may ask are designed to help them find permanent and loving homes for pets that greatly deserve a second chance. Additionally, if the dog you adopt is not a good fit for you, the rescue will usually take the dog back. If you have a Weimaraner and you have not been able to devote the time to your dog, your dog has developed bad habits that you cannot correct, or you are not able to care for your dog properly, do consider taking your dog to a Weimaraner rescue or another organization like the ASPCA Rescue. In addition to relieving yourself from the dog-related problems, you will be giving your dog a chance to have a permanent home and a happy life! Making this decision is very difficult, but, if it’s the right thing to do, you (and your dog) will both be happier! Learn more about how to adopt a dog or puppy here.